Halloween is synonymous with candy and sweets. Every year, children go from door to door, working under the moonlight, for the sweet candy wager. However, as every true Halloween buff knows, there is much more to the spirit of Halloween than the sugar rush. There is also a crisp, slightly eerie but ultimately fun side to the holiday. It is a time where people are encouraged to use their imagination. So, why not also use your imagination to brew up some healthy Halloween treats? Here are fifteen affordable, fun and healthy Halloween Party Foods to start the churning of alternative treat ideas! 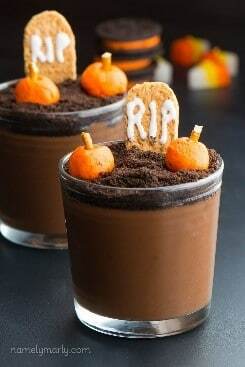 These ghoulishly delicious chocolate pudding graves are to die for! These graves are dug with vegan, peanut buttery goodness and are sure to be a hit at any Halloween get-together. Let the size of the party cup be your guide as you unearth this irresistible, healthy treat. Pro Tip: If there is a peanut allergy issue, the graves can be made from another vegan-acceptable cookie or cracker. The only hint is to try to make it look like a grave marker. However, whether it is a cemetery full of headstones or mausoleums is up to you! Eggs are so versatile, in both a culinary and decorative fashion. These deviled eggs are more than simply devilish, their downright delightfully arachnid. 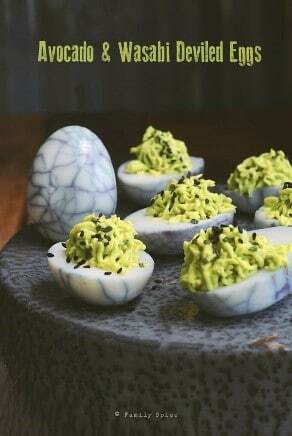 Made with blueberry water, wasabi, and boiled eggs, these little terrors are sure to be the talk of the party. Pro Tip: In place of wasabi, use food coloring, for those who are not a fan of such a spicy devil. These bandaged-wrapped bananas are not just for show. They are also so good, its’ frightening. 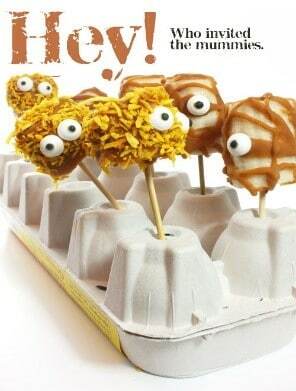 These little scares on a stick are easy to make, with only four ingredients. Well, five if you count the stick. To unwrap the secret to success with this treat, use bananas, coco butter, coconut sugar, and eyes. This is a fun and safe snack to make with the kids too! Forget the eye of newt and get back to basics. This adorable, healthy, and affordable treat is sure to soar past any culinary competition, because it is quick and easy. 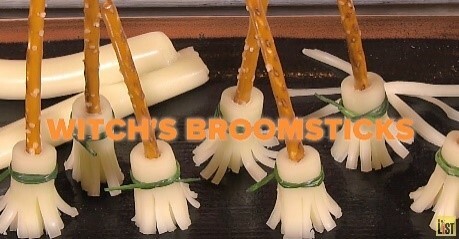 String cheese, a pretzel, chives, and this twenty-four-second video is all you will need to create this healthy, witchy pleasure. This healthy dish is sure to please guests right down to the bone. 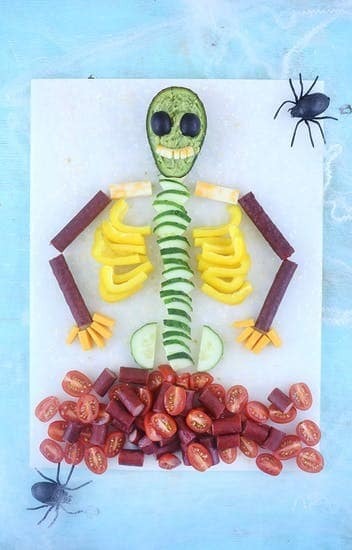 The Skeleton Snack tray is comprised of your favorite vegetables, cheese, and a few mini sausages (or peperoni). When fashioned in the smiling shape of a skeleton, it is a fun way to introduce vegetables into a party. Pro Tip: For the head, use a vegetable dip to complete the bone structure in an accurate manner. Putting a Frankenstein face on pretty much anything is usually considered a Halloween win. Old Franky is so diverse. He can be cute, scary, sad, happy, or have a range of emotions. 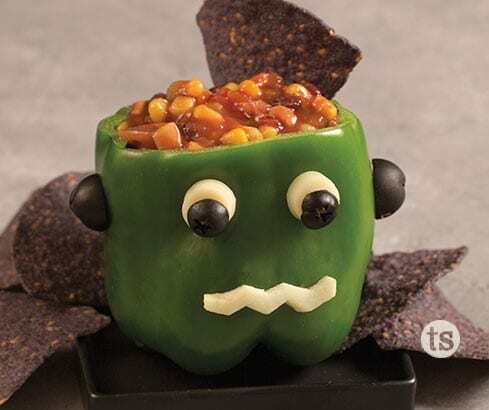 Plus, with this chips and salsa monster, you can fill his head with whatever delight you fancy. This recipe is extremely easy and can be completed in about five minutes. Stuffed peppers always seem like a dish that is underrated. Many people enjoy both the meat and vegetarian versions of this dish, but it is hard to find. 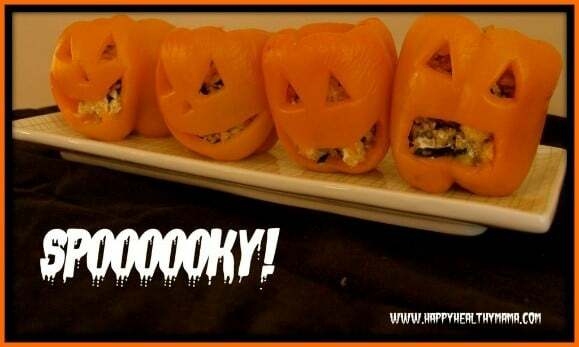 However, making Halloween Stuffed Peppers takes this delicious meal and makes it fit for Halloween. For those who have made stuffed peppers before, the only difference is that the peppers are cut to resemble a carved pumpkin. Yet, this small difference means turning up the haunted on your Halloween bash! This is extremely easy, yet equally effective. For school parties and other get togethers where you do not know all the kids, this is also a safe snack. All you need is a fruit cup (oranges work best) and a sharpie. 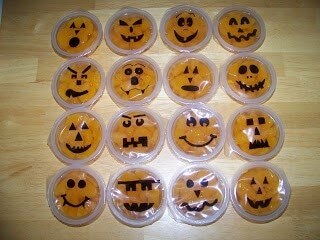 Have fun with the containers, giving it a face for the kids to enjoy. Plus, it is a snack that is still sealed, so it is simple to transport. Pro Tip: This is also a cute way to add a festive surprise to your children’s packed lunch or snack. 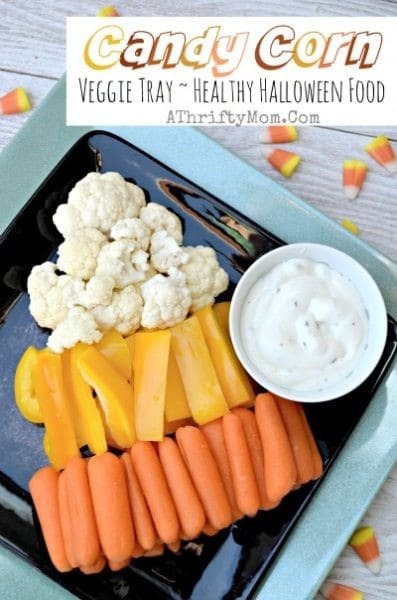 For a not-so-scary, but still incredibly festive, healthy snack, a Candy Corn Veggie Platter is always a winner! Take different colored vegies, (white, yellow and orange) and arrange them in a pyramid fashion. Whether the platter is large or small, it is still sure to please. Add your favorite dip to compliment the veggies and you have created a healthy, affordable, festive treat. 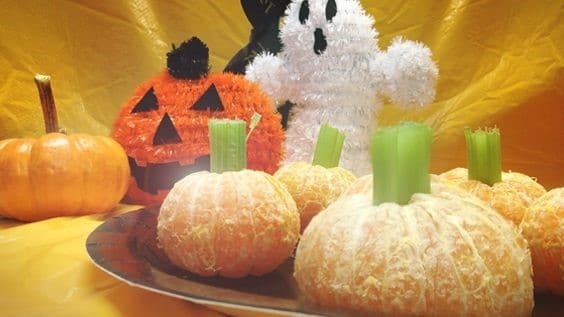 This Halloween snack idea involves a clementine and a celery sprig. That’s it! Simply peel the clementine, stick a celery sprig in the middle and…Presto! You have transformed a summertime treat into a harvest delight! This is a treat that can be as silly or as scary as you wish. 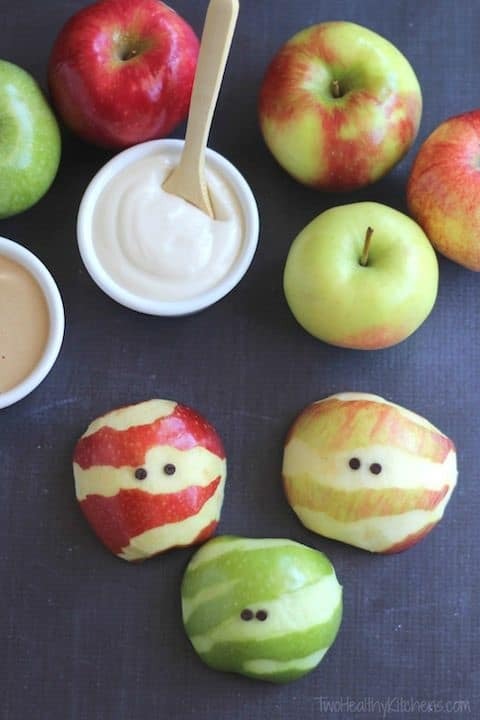 Use apple wedges for the mouth and get creative for the teeth and tongue. The result is a Halloween treat of monstrous proportions. Easily transform plain mozzarella snack into a Halloween favorite. This healthy snack hack uses Babybels, food dye, and olives to make the spooky spirit of the season come alive. This is a simple, but effective snack hack that kids will absolutely love! Pro Tip: In addition to making creepy eyes, this trick can also be used to make Angry Bird eyes, Santa, and Pokeballs. With a little imagination, this treat can go a long way for any kid-friendly get together. 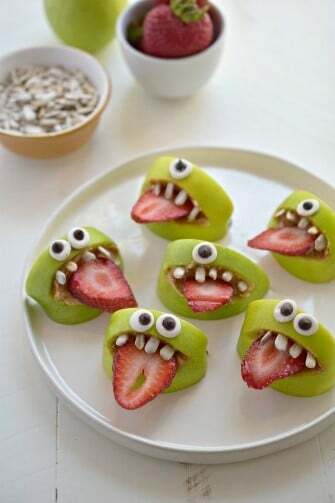 This is a frighteningly creative, yet surprisingly simple snack that is sure to turn some heads. 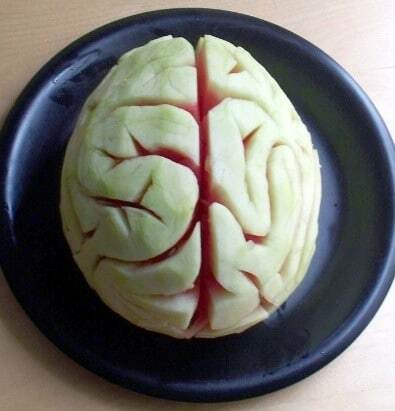 Use a melon to create a brain by removing the outer layer, down to the white rind. Once there is a bald melon staring back at you, take a paring knife and etch veins into the melon. This will create a Spooktacular design that can be used as an intriguing centerpiece, or just part of the spread. Out of all the easy, affordable, healthy party foods on this list, this is likely the easiest. How do you like those apples? Mummified, of course, because it is Halloween! Basically, all this festive snack needs are an apple, a peeler and something to count as eyes. Use your best carving skills to transform an unsuspecting apple into the perfect Halloween treat. Pro Tip: Use raisins for the eyes to amplify the healthy-meter on this horrifically simple Halloween snack. 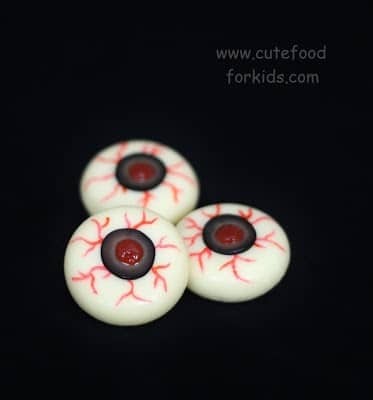 These eyes are allergen free and easy to create. Whether you are looking for a snack that stares back, or part of a grander design they are a masterpiece. These sweet, yet healthy sandwich snacks take PB and J to a whole new level! Plus, this snack is easy enough that it can be made with the little ones, which adds to the fun! To close, Halloween is a time for imagination and fun. The traditional treats are secondary to the fun that can be had with affordable, fun, and healthy Halloween party foods. Plus, these healthy snacks are great for keeping kids energized. That way, they can enjoy all the bounce houses, party games, and costume contests the season brings. 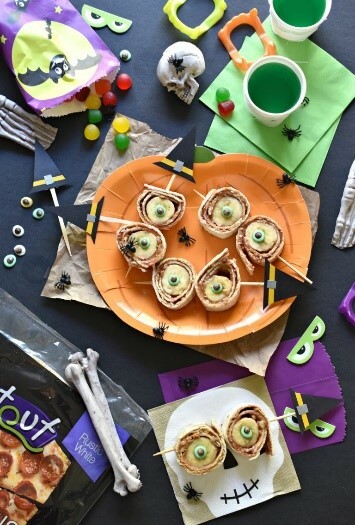 Try a few ideas today and add a little bit of your own creativity to make the treat unique!